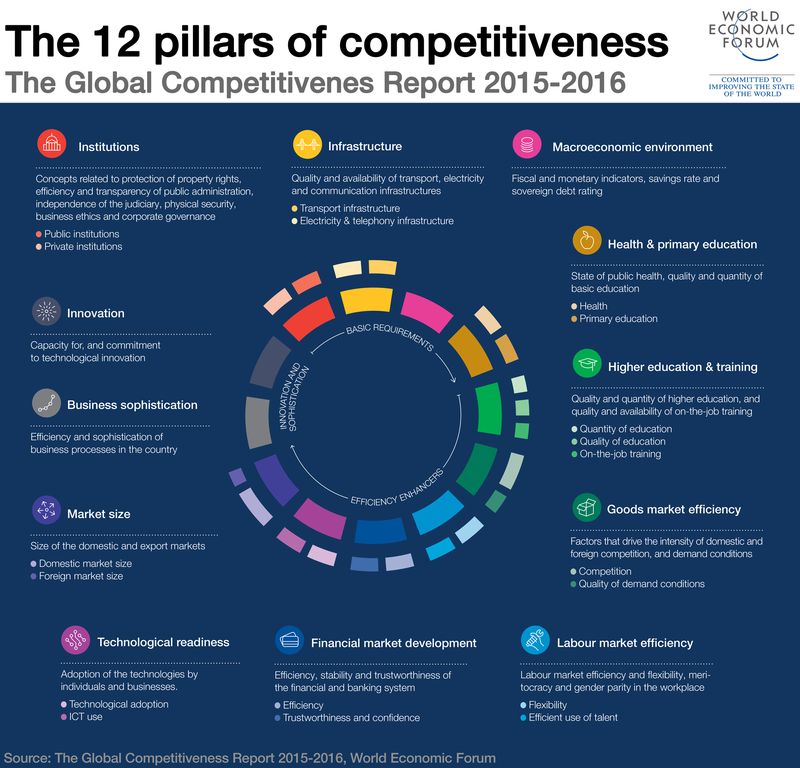 Norway is number 11 in the Global Competitiveness Race facilitated by The World Economic Forum. The World Economic Forum is the International Organization for Public-Private Cooperation to shape the global, regional, national and industry agendas. Their yearly competitiveness report,The Global Competitiveness Report, benchmark 140 countries in respesct of 12 pillars of competitiveness. If competitiveness is interpreted as productivity, the Report is a key image of growth and resilience power. The Report serves to inform and support policy-makers, businesses and civil society in their development of a shared, long-term vision for impovements. The Report is a tool to share assessment and understanding of the future sources of competitiveness. This is made possible by reducing complexity and highlighting strengths and weaknesses and tracking progress of economies. Norway is ranked as number 11 compared to Switzerland as number 1 for the seventh consecutive year, but before Denmark ranked as number 12 of the 81 advanced world economies. Norway tops the scales of macroeconomic environment and technological readiness. However, the main area for improvement is the size of the foreign markets since the domestic market is indeed small. Other areas to improve in the Norwegian economy are related to transport and communication infrastructure and factors that drive the intensity of competition. Also the efficiency and the sophistication of the Norwegian business processes and the flexibility of the labor market including efficient use of talent have a lower score. Regarding innovation, none of the participating countries have a full score on the innovation scale. Even Switzerland who tops the pillar, scores 5,8 against the 7,0 as is max. The Scandinavians are close with; Finland 5,7, Sweden 5,5, Denmark 5,1 and Norway 5,0. Switzerland leads the innovation pillar, thanks to its world-class research institutions (1st), high spending on research and development (R&D) by companies (1st), and strong cooperation between the academic world and the private sector (3rd). But many other factors contribute to Switzerland’s innovation ecosystem, including the level of business sophistication (1st) and the country’s capacity to nurture and attract talent. Switzerland boasts an excellent education system at all levels and is a pioneer of the dual education system. The labor market is highly efficient (1st), with high levels of collaboration between labor and employers (1st) and balancing employee protection with flexibility and business needs. Swiss public institutions are among the most effective and transparent in the world (6th), and competitiveness is further buttressed by excellent infrastructure and connectivity (6th) and highly developed financial markets (10th). Last but not least, Switzerland’s macroeconomic environment is among the most stable worldwide (6th) at a time when many developed countries continue to struggle in this area. These very strong economic fundamentals help to explain Switzerland’s resilience throughout the crisis. Yet recent developments have created a number of downside risks and leave little policy space. These include the sluggish recovery in key trading partner countries; the appreciation of the Swiss franc following the exit of the exchange rate floor; near-zero inflation; and negative real interest rates. Uncertainty about future immigration policy following the referendum against “mass immigration” could undermine Switzerland’s capacity to tap into the global talent pool needed to power its economy. Switzerland must continue to sharpen its competitive edge to justify the high cost of doing business in the country. The systematic assessment of the drivers of productivity is based on the links between productivity and each of 12 categories consisting of as many as 5 – 25 subcategories. Information is captured by the World Economic Forum Executive Opinion Survey and the World bank among others. This is translated into the main pillars of the Global Competitiveness Report and thus are measured through variables and proxies. There are some limitations: as is often the case, data gaps force the Report to rely on proxy measures to capture certain concepts. For instance, in the case of ICT infrastructure, ICT uptake among the population are used to approximate uptake among businesses. Also, the infrastructure pillar measure whether the current provision of transport, energy, and ICT infrastructures and connectivity meet the needs of a country’s economy by combining quantitative and qualitative measures. Although they are relevant for policymaking, the Report tend to exclude input measures—such as expenditures, investment regimes, and partnership models—for two reasons. First, mixing input and output measures risks double counting. Second, ample evidence shows that input measures, including monetary investment, are poor indicators of either quantity or quality of the dimension measured.